International workshop Schedule for 3-4 May 2018. Biogas Plants to be Installed at UMSGET and Campus Canteen in Pondicherry University. The UMSGET has taken the initiatve to install two Biogas plants at UMSGET and Campus Canteen in the University. These plants are being procured from Integrated Rural Technology Centre, Kerala, with the sole purpose of providing training and research. Scheduled for the 12th April 2018, the installation will be followed by sessions on technology by the experts. 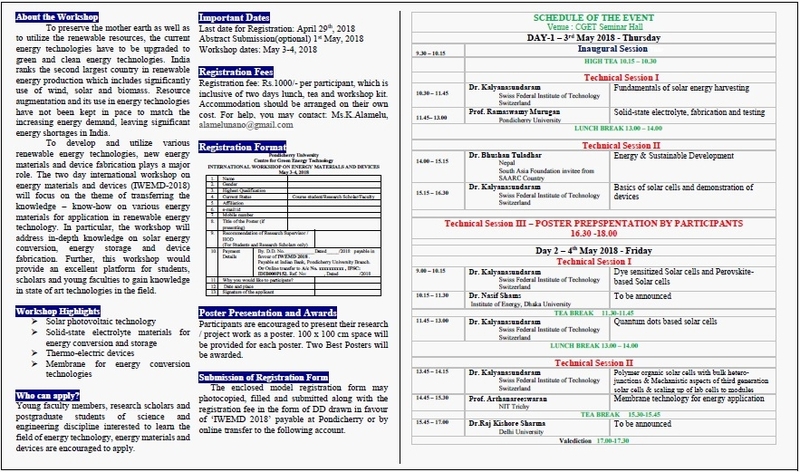 International workshop on Energy Materials and Devices Schedule for 3-4 May 2018. 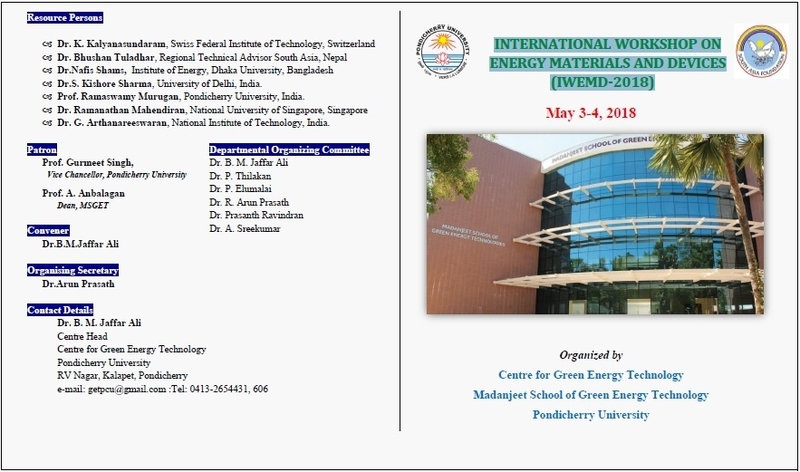 The Centre for Green Energy and Technology (UMSGET), is organising a two-day international workshop on Energy Materials and Devices on 3-4 May 2018. In this regard, the UMSGET has invited two resource persons, one from Nepal and another from Bangladesh. Eminent experts, drawn both Indian and overeas, representing different institutes/universities will be participating in the workshop. This include, Prof.Kalyanasundaram from Switzerland (EPLF), Professor Arthanareeswaran from NIT Tirichy, Professor Murugan, PU, Head of the Dept. Physics, & Principal Investigator Laboratory for Advanced Energy Materials, are scheduled a series of talk and demonstration.